Let me set the scene for you. It's 1985, Wham!, Duran Duran, Spandau Ballet and U2 are playing on the radio and a pair of 13 year olds with incredibly bad sheep perms and a pair of racer bikes become friends (listen, having a curly perm was THE LAW back then...). Fast forward to 2011 and they're still the very best of friends and with just 8 weeks between their birthdays, decide to have a joint birthday party. This year, we're both 40 (she's older than me by 8 weeks). It's quite scary how fast the past 26 years have whizzed by, to be honest, and we wanted to celebrate it together by having a birthday night out with the girls somewhere lovely. We decided to spoil ourselves and stay somewhere suitably gorgeous (we're worth it, don't you know) and being the Chief Organiser of Everything We Ever Do, I chose The Westbury. They offer a great package called Stay Wilde which is tremendous value for money - it includes overnight accommodation in one of their stunning bedrooms, a cocktail in the Marble Bar, a 3 course meal & wine in Wilde Restaurant and a full Irish breakfast the next morning. I already knew that The Westbury was a great venue having been there for Donal Skehan's Afternoon Tea and using it for our work clients but from the moment we entered, we were spoiled absolutely rotten and the staff really couldn't do enough to make sure we had an amazing stay. 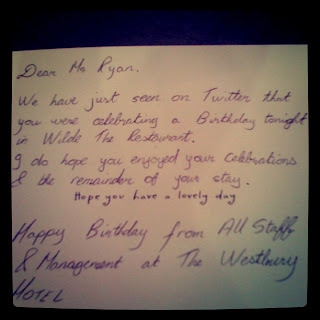 In fact, they even gave me a birthday card (I must stop Tweeting while I Eat) which was incredibly thoughtful of them. Sounds like a great evening! 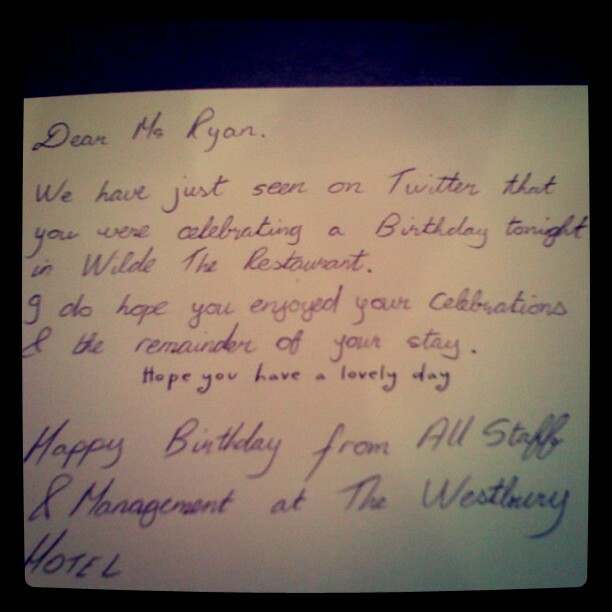 & what a nice touch giving you that birthday card! I love how they gave you the card. When I spent my 30th birthday in a hotel in Barcelona, they gave me a cake! They spotted that it was my birthday when they scanned my passport at check-in. How nice is that! It really makes such a difference when hotel staff make gestures like that, doesn't it?